KNOXVILLE, TN — They are some of the most powerful women in Knoxville and East Tennessee. They stay busy but found the time to sit down with 32 women from across Knoxville to share and give some insight about who they are and how they handle the high profile jobs in which they serve. Eve Thomas, Knoxville Chief of Police and Deb Schmitz, other co-founder of Ignite Women. 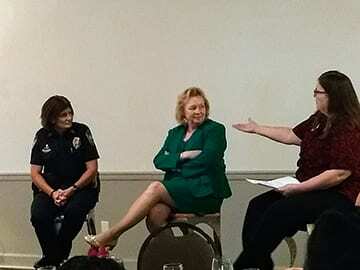 During a women’s leadership luncheon held at Rothschild Catering and Conference Center, the event: Women Who Bring Justice, sponsored by Ignite Women; featured Knoxville’s Chief of Police Eve Thomas and US District Judge Pamela Reeves. The women fielded questions about their careers, background, how they were treated by their peers, and issues currently of concern in the community: among them the opiod crisis on the local and state level. Both women are part of a unique wave of change sweeping the country. They are the first females to hold their position. 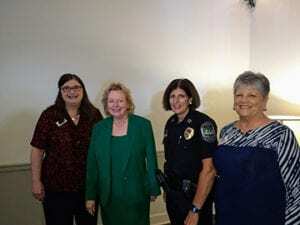 Police Chief Thomas was named to her position by Mayor Madeline Rogero, who was also the first female Mayor of Knoxville. Chief Thomas holds a Master’s degree from Long Island University Homeland Security Master’s institute, and BA in Psychology from the University of Tennessee, Knoxville. Judge Pamela Reeves, nominated by President Barak Obama, is the first female to serve as a federal judge in the US District Court in the Eastern District of Tennessee. Chief Thomas advised the women to “step forward and put themselves our there”. She also advised women to nurture each other and not cut other women down. Judge Reeves said to be willing to make a decision and live with it. She advised against second guessing themselves and be willing to “make the call”.